Dow Jones, one of the oldest of indices is a good barometer of the US Financial Markets and a strong fore runner for other financial markets of the world. 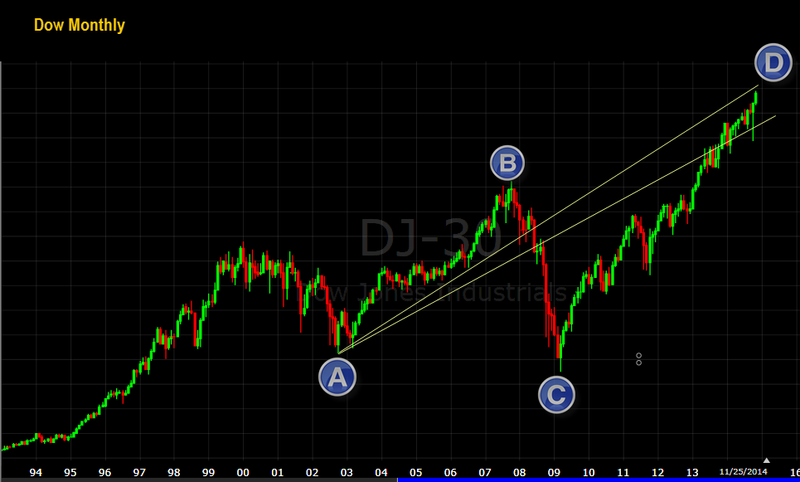 On a monthly scale, Dow has been correcting since 2000.It is currently in the D leg of what looks to be a huge diametric. If it is going to be a diametric, we may see three smaller legs, E down, F up and G down, before the pattern is completed.D leg is close to topping out and we could see a good down move in the form of E. But E may not be as severe as wave C.This may happen in the first or second quarter of 2015. 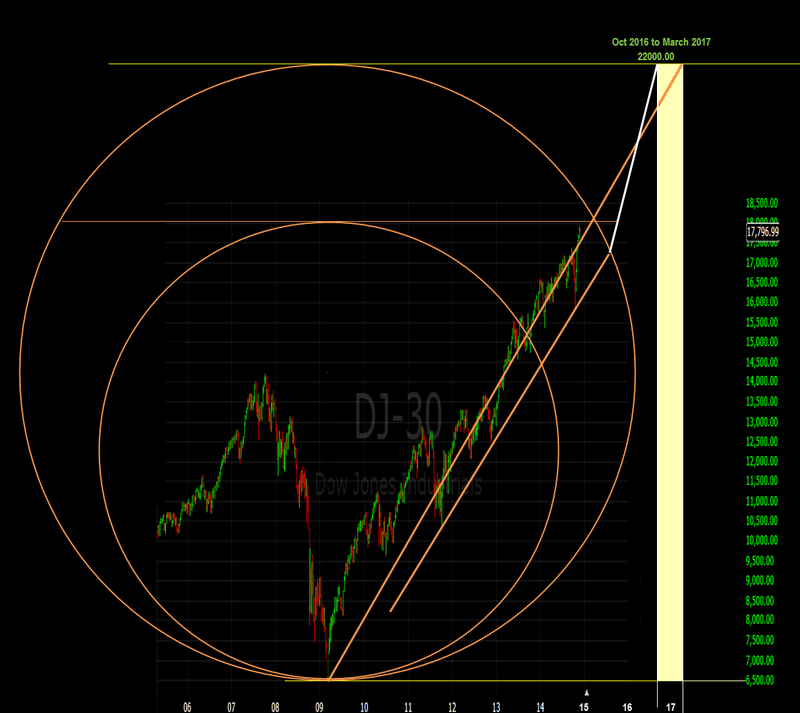 If we shift to a weekly basis,expand the chart and look at the developing wave D closely, we see that it a double diametric so far, connected by an x wave. Since it is perfectly channeling, this is not an impulse wave.Currently we are in wave g, which may top out around 18000. After that either wave E down could start or we may have another x-abc development inside the channel itself, before the top out occurs. 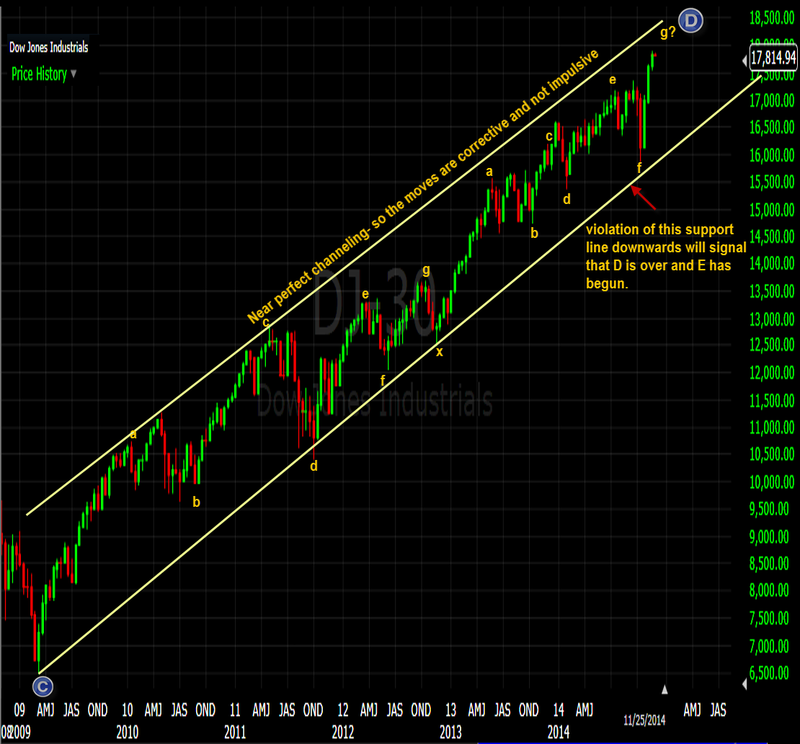 Latter option seems to be more plausible as of now.At the time of this article, Dow is around 17800. 18000 seems to be the immediate top resistance, after which the move could continue with ups and downs till 22000, sometime in 2016. Hi Suresh. I am one of ur oldest readers. If u remember I had made a suggestion regarding finding stocks with astro formations that can turn out to b super multibaggers comparing it with the astro formations of previous phenomenal wealth creators. U had mailed me regarding the same as work in progress but I received no update. Ur back to blogging n I hope u will surely do the honours this time. As always ur work is commendable n to thank you will not b enuff. Thanks for your comments. Iam still at it. Iam ironing out several differences yet. It is the paucity of time which is delaying the study. Hope to bring it to light in 2015. This is also one reason why I occasionally analyse some stocks.